Welcome to the next installment of Swiss Family Skiing, all about tried and tested family friendly ski destinations throughout Switzerland! I always dreamed that skiing would be our family sport. But unlike the rest of my family, I didn’t learn to ski when I was young and so now I still struggle on the slopes. I’m just a little too scared of getting hurt (who would look after mum when she breaks a leg?) and so have stayed off the slopes for the past 5 years. That means I often miss out. But not at this next destination. 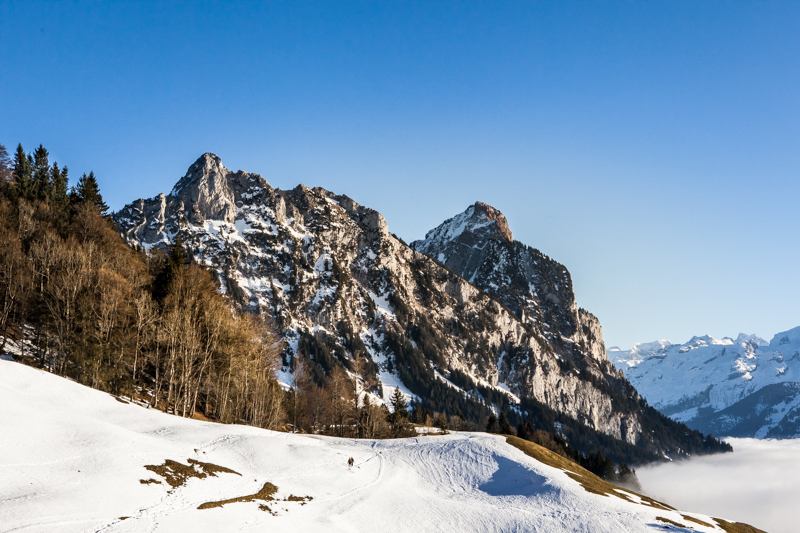 Hoch Stuckli, located in Canton Schwyz is not only a great place to learn to ski, but also a great place for non-skiers to enjoy the snow and still be able to have lunch with their favorite skiers. Today I highlight one of my personal favorites for you! Sattel Hochstückli has a special place in our hearts. Not only is it the closest ski slope to our home but it’s also where both of our older kids took their first ski lessons all those years ago. The Kinderland at Hochstuckli is a great place for young kids to learn to ski. Park at the large car park (Eumatt, 6417, Sattel for you GPS) directly at the Gondola station. But beware: On the weekend, especially if it's grey down below and sunny up above, this car park has been known to easily fill up by lunch time. Get there early for minimal stress! Public transport is also an option in combination with the gondola and it is only a 10 minute walk from the “Sattel-Aegeri” train station on the Südostbahn (SOB). Or, on weekends take the new “Stuckli Express” bus which drives directly from Zug. Your day pass includes the bus. (39 chf for adults and 26 chf for kids). The area is great for families. Beginners can stay in the Kinderland while the more experienced can head to more challenging pistes, a mixture of blue and red runs. A magic carpet is an important part of any Kinderland. 4. Is there a ski school? What facilities are there for beginners. I can highly recommend the local ski school and it is where both of our eldest learned to ski. They first took private lessons to get a feeling for their skis and then moved quickly into the group lessons. The ski school offers morning and afternoon classes on Saturdays and morning classes on Sundays, as well as private lessons. During the ski holidays there is a special program. But book as far in advance as possible so you’re not disappointed. The newly reimagined Hoch Stuückli Kinderland is a great place to learn to ski and it is complete with a practice lift and magic carpet. During the remodel they also created a long magic carpet tunnel that will take you from the Kinderland back up to the gondolas. No more dragging tired kids up on their sleds! Tip: to enjoy the sunshine, come here in the morning! New this season is their 1-2-3 ski program which aims to get beginners new and older on the slopes. For 111 chf adults and 99 chf for kids it includes a day card, ski school, and ski rental (including helmet) and lunch. I highly recommend the competent staff at Tony Sport who are located at the Gondola station near the car park and also in their store year round in Rothenturn just down the road. We rent (seasonally for the kids) and buy (for the adults) all of our skis here and are always feel we’re in capable hands. No more walking up to the Gondola! The new magic carpet takes you right up to the Gondola. This is where Hoch Stuckli shines - its not just for skiers! And I should know as I haven’t put skis on for over 5 years. You have a couple of different winter hiking options including my favourite warm weather route, RUNDweg Engelstock. A snowshoeing route is also available. Sledding in Hoch Stuckli is not for the faint hearted, with a 3.5km prepared sled route that goes steeply down the mountain to the carpark. Not so adventurous? Enjoy the small hill next to the Kinderland or take the sled and walk up to Herrenboden and sled back down. Sleds can be rented at the gondola station for 8 chf each. There are lots of places to eat in Hoch Stuckli including Mostelberg, Mostler’s Q-Hof, Engelstock and Herrenboden, depending on where you are skiing. On a sunny day you will find me reading a book and enjoying the sunshine at Herrenboden with a Schumliflumli and one of their homemade cakes. 8. What set your ski area apart from the rest? Family-friendly Hoch Stuckli is a great destination where both skiers and non-skiers can have a great day. I like that I can still meet my skiers for lunch or a hot drink. The ski area is not too big, so the older kids also can ski on their own without us having to worry. 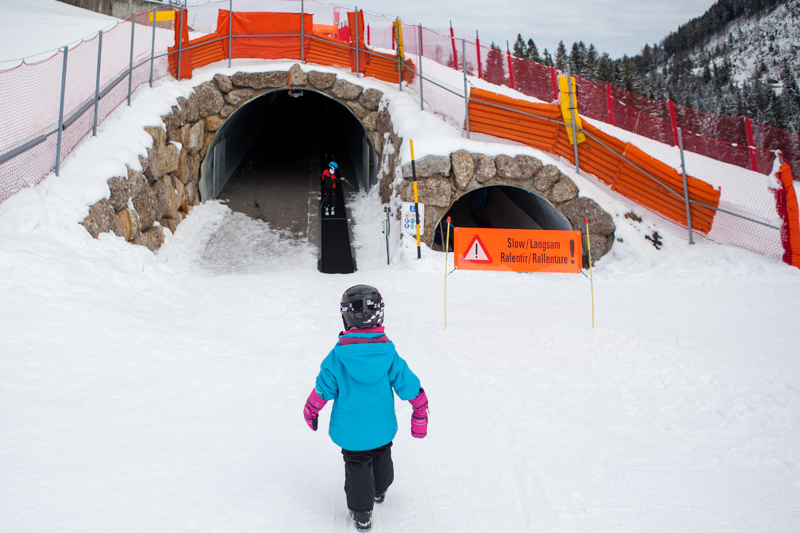 What had been frustrating in the past was the walk back up to the gondola station but the newly constructed magic carpet tunnel has solved that issue! Our Ikea bag! Those big blue Ikea bags are ideal for carrying all the ski gear! As we leave the house we throw in our jackets, gloves and extra socks. Big enough to be able to hold everything! I’m Kristin, the blogger, photographer, and founder of SFT! My family of 5 consists of 3 skiers and 2 non skiers but I hope one day to change that as little Z learns to ski.